McAfee Security for Email Servers provides comprehensive content security for Microsoft Exchange and Lotus Domino servers. Industry-leading protection — Uses award-winning McAfee in-memory and incremental on-demand scanning to remove viruses, worms, Trojans, and other threats from incoming and outgoing email. Strong internal safeguards — Detects threats that may have either slipped past your perimeter defenses or entered your network via infected laptops and internal email. It also blocks spam with the anti-spam module. Powerful filtering — Enforces corporate policies for email use by filtering offensive content and plugging leaks of sensitive data. Single console management — Use the McAfee ePolicy Orchestrator (ePO) platform to manage security and view detailed graphical reports from a centralized web-based console. 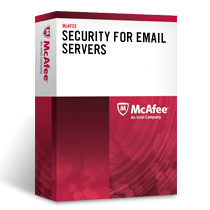 McAfee® Security for Email Servers detects and filters viruses, worms, Trojans, and other potentially unwanted programs. Compatible with Microsoft Exchange or Lotus Domino servers, it blocks spam and filters messages to guard against inappropriate or sensitive information entering or leaving your network, helping you meet policy and compliance requirements. Strong internal safeguards—Detects threats that may have either slipped past your perimeter defenses or entered your network via infected laptops and internal email. It also blocks spam with the antispam module. McAfee Security for Email Servers relies on realtime file reputation anti-malware that significantly reduces exposure to emerging threats. Using cloudbased McAfee Global Threat Intelligence™ (McAfee GTI™), McAfee sends a fingerprint of any suspicious file for instant reputation analysis at McAfee Labs. If the fingerprint is identified as known malware, an appropriate response is sent back in milliseconds to block or quarantine the file. McAfee GTI message reputation is our comprehensive, real-time, cloudbased message and sender reputation service that enables McAfee products to protect customers against both known and emerging message-based threats such as spam. Detect threats from email messages based on the sending server’s IP address. IP reputation prevents damage and data theft by blocking the email messages at the gateway. Check incoming and outgoing email messages for viruses, worms, Trojans, and other malware. Additionally, you can scan all internal emails to block a worm from propagating internally. McAfee Security for Email Servers automatically downloads the latest virus definitions (.DAT files) via HTTP, FTP, network file share, or the McAfee ePO centralized management console. Filter messages based on size, message content, or attachment content. Block or quarantine messages that contain controlled content in the subject, message body, or attachments. Prebuilt content filters simplify policy creation and enforcement. Create rules on a global basis, with exceptions as needed for individuals and departments. Manage via the built-in HTML interface or the McAfee ePO platform. Scans content and text in the subject line or body of an email message and email attachment. Create your own content filtering rules based on regular expressions (Regex). Data loss prevention (DLP) ensures that email sent (in motion) or at rest is in accordance with your organization’s confidentiality and compliance. Prebuilt dictionaries for enterprise and countryspecific compliance rules provide quick setup. The built-in workflow automatically forwards quarantined emails to auditors for review. Catch spam and phishing emails with the antispam module to maintain employee productivity and reduce wasted email server storage. Users may create their own whitelists and blacklists. A single quarantine solution shared with the McAfee gateway email solutions provides an easy way for users to access a single quarantine. McAfee Security for Email Servers sends notifications to the specified administrator regarding the product’s status. These notifications can be configured and scheduled according to your requirements. Count on automatic updates to keep you current with the latest security intelligence from McAfee Labs, the world’s top threat research center. Included in McAfee Security for Email Servers, McAfee Quarantine Manager consolidates quarantine and antispam management functionality in a single solution. 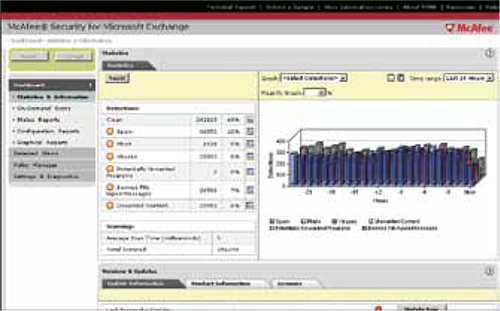 McAfee Quarantine Manager is easy to manage, allows sample submission to McAfee Labs, and provides finegrained administrative controls, automatic user synchronization from LDAP servers, management of user or global blacklists and whitelists, and granular reporting—all managed from the McAfee ePO platform. Ensure protection for your email servers on major operating systems, including Microsoft Windows and Linux on 32-bit and 64-bit platforms. McAfee Security for Email Servers supports scheduled on-demand scanning with granular configuration options to quickly complete scanning as compared to traditional full scans. It includes an option to scan only emails with attachments, unread emails, subject, sender, recipient, CC, message ID, and received within certain a period and of a certain size. The simple-to-use interface provides rich reporting, charts, and real-time email traffic statistics. These are minimum system requirements only. Recommended requirements are in parentheses, where applicable. Actual requirements will vary depending on the nature of your environment. With the exponential growth in email and shared data on email servers, McAfee Security for Email Servers supports both the Microsoft Exchange and Lotus Domino environments to keep employees productive and organizations up and running 24/7.